Last night I logged in and immediately looked for a fleet. I wanted to PvP, looking to record my best month in a long time. I found one called "Squid Squishing" and led by an FC I've flown with before in the milita, Red 5oyna. Our small fleet was of various small sizes led by our FC in a Vigilant, a ship I admit some desire to fly. Its been added to my shopping list after last night. I decided to go with an Ishkur since I had fun in my Enyo last week but wanted something with a bit more tank to survive any surprise Thasher warp ins. We came across a pilot named Sa'haira from the infamous Tuskers corporation flying a Drake. It quickly became apparent that it was a nano-drake as it boast impressive speed and agility while avoiding our frigate tackles. We chased it for a while, and props to Sa'haira who was trying to get a fight by splitting us up and fighting one or two at a time instead of just running, but we got lucky when she warped to a celestial where one of our tacklers was waiting. We glomed on the tackled battlecruiser and reduced it to slag in short order. Excellent start to the evening. We started moving towards Akidagi in Black Rise region where a lot of hostile traffic can be found it seems. We got to the system and stumbled across a war target Caldari Navy Hookbill and quickly dispatched it. Then things got interesting. I'm not sure the exact order of events as I never got visual contact with the hostiles, but we got reports of an enemy fleet in Akidagi on the Ichoriya gate. Some cruisers and a Gila faction battleship cruiser and Machariel faction battleship. Our scouts played with the fleet but we lacked the firepower and tonnage to go up against the enemy so we moved on for a bit. When we came back our scouts found the Gila, alone, in the system and we pounced. We chased him from one celestial to another, and he was surprisingly fast (my overview put him in the 2km/sec velocity before he was webbed) but caught him finally at a planet and poured our firepower into him and he went down. Now, looking at the killmail there are 18 involved but 6 of those pilots ( the ones with unknown ship types) were never part of our fleet and we never saw them (and the Gila's shields were at 100% when we engaged). I speculate that another Gallente militia fleet ran into the Gila's pilot's fleet and scattered them just before we showed up and caught the faction battleship cruiser before they could regroup or retreat. Regardless I looked at the killmail and noticed the corporation ticker of Fancy Hats Corporation, home of fellow bloggers Corelin and Orrakus. Consider the gauntlet thrown fellas. 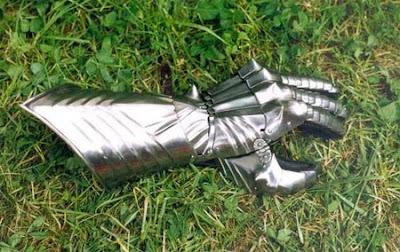 The gauntlet. I has thrown it. After that awesome catch, we heard that some crazy pilots in the Caldari militia were running around in four Battle Badgers (double warp stabbed of course). We picked up their trail Pynekastoh and caught one of them after jumping through a gate. Boom! (I had switched to a Dramiel by this point as we tried to catch a lot of hostile frigates leading up to this point and they were always *just* getting away from our tackle so we needed more fast lockers). Props to the Caldari for doing something different and entertaining, I hope they had fun. Totally going to organize a Battle Iteron fleet someday. With that I logged out shortly thereafter and am pleased to report my best month of PvP in a long time with 17 kills (including pods) and 2 losses over 5 two hour gaming sessions. Here's looking forward to August! That's actually incorrect. The Gila is the Gurista faction cruiser but on the Moa hull. IIRC, of the indies, only the Badger really has the slot layout to be even remotely combat effective. As a result, I think a battle-itty fleet would be hilarious to hear about.